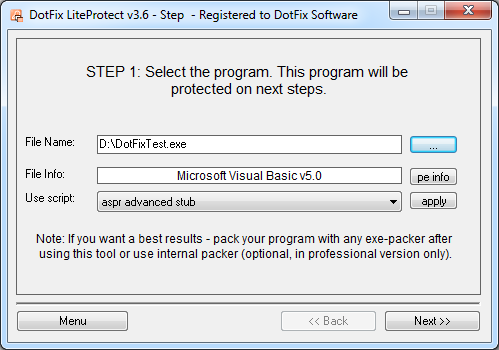 DotFix LiteProtect is a software protector that uses a number of anti-unpacking features. Though it doesn't provide strong protection, it's virtually impossible to unpack any program protected by DotFix LiteProtect with a generic unpacker. Before packing your program, LiteProtect will encrypt its code section and entry point. Thanks to the polymorphic code and the packer's signature modifications, LiteProtect can successfully fend off any automatic unpacking tools and most novice crackers. Supports all Win32 compilers (Visual C++, C++ Builder, Delphi, and Visual Basic).